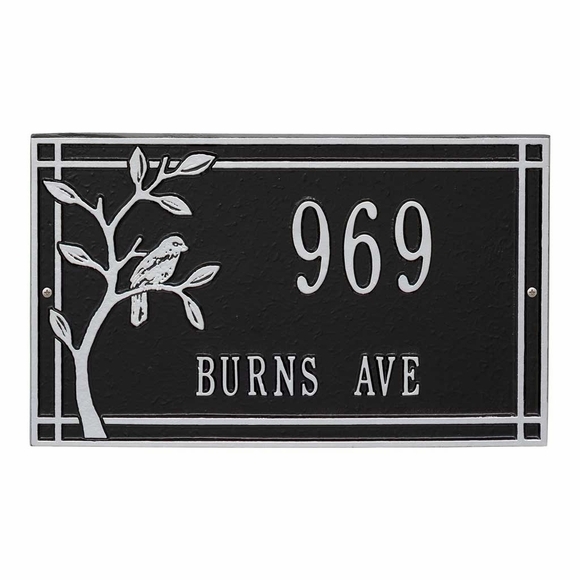 Surface Mount Address Plaque with Street Name - - personalized address sign includes the address number and street name you supply as well as a graceful bird and branch accent to the left of the address, and decorative border. Made in USA. Rectangle 16" x 10.5" address marker for your front porch or a column. Includes two line of personalization at no extra charge. Line 1 holds up to five (5) 3" characters for the address number. Line 2 holds up to fourteen (14) 1.25" characters for the street name. BG black surface with gold characters; (large image). Small images (from left to right): AC antique copper; BS black surface with silver characters; BV bronze verde; OB oil rubbed bronze; and OG bronze surface with gold characters. Dimensions: 16.5"W x 10"H x .375. To purchase the lawn mount version of this sign, click top link in Related Products.